Along with cold weather, winter brings salt, sand and other debris that is not only ugly to look at– it can create long-term autobody issues. The best way to counteract these problems is to regularly clean your vehicle, but there are specific strategies to get the most out of its washings. 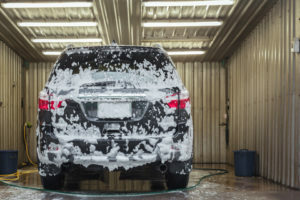 Keep reading for Freeway Auto Body’s top five tips for washing a vehicle in the winter months. Always make note of the weather before you commit to the effort and cost of washing your vehicle. Though it can be nice to clean off the grime when the conditions are slushy, it may be wiser to wait until it cools down– otherwise, it will end up dirty again! Also: if you park outside, beware the very real possibility of frozen locks and latches. To avoid this, wash the vehicle exterior first and allow it to dry completely as you tidy inside. Most auto body professionals recommend cleaning your vehicle every one to two weeks– more often if it is exposed to road salt. Under normal circumstances, a wash every ten days is usually enough to keep the bodywork in peak condition. Make it a habit and you will hardly notice the investment of time. If you have space, washing with your own equipment is often the easiest way to stay consistent. Car washes are easy to find, but ensure your chosen space and equipment is kept as clean as possible. Manual or “wand” washes allow the customer the most control, but the quality of tools and other factors can vary. Automatic or “drive-through” washes are extremely convenient, but they may not reach all of the nooks and crannies (always check for damage after). If the wash is not touchless or offers foaming brushes, they may accumulate dirt or debris that can damage a vehicle’s finish. Washing a vehicle does not end with the parts that you can see– always make use of an automatic undercarriage spray if available. At a manual wash, pay special attention to the tires, wheels, wheel wells and other components close to the ground. These areas are especially at risk of degradation caused by salty, sandy or dirty snow, slush, and ice. Cleaning your vehicle often is a smart investment, but there can be too much of a good thing! Water and soap can settle into crevices, seals and other hard to reach areas– eventually causing damage, particularly if they thaw and freeze. Drive slowly through a timed, automatic dryer or use a handheld dryer to finish off spots around mirrors and glass. Clean rags or chamois are ideal for drying up tricky sections by hand. The five tips above are only a starter guide to the wide and varied world of auto body care. There are countless products on the market that make wild claims about preserving and restoring your vehicle’s finish. Bring any of your questions and concerns to the auto body professionals here at Freeway today!